The Winter War post yesterday looked at the uniform and kit worn by British troops during winter periods on the Western Front. This image, dating from 1915, shows a group of German soldiers dressed in their version of the make-do gear to keep them warm during a winter in the trenches. The sturdy coats are leather with a fur liner, again likely to be sheep or goat fur like the British version but a more complex garment and perhaps a little better? 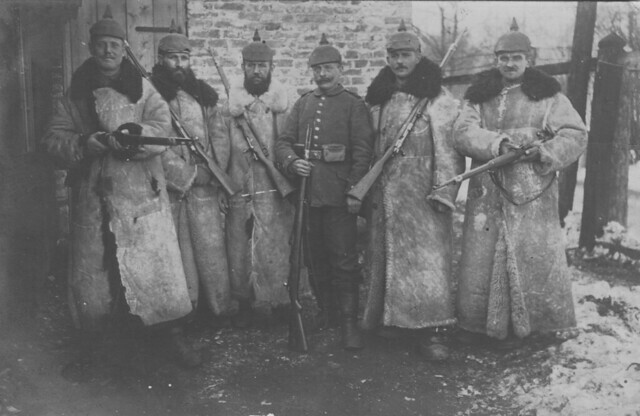 The coats have a fur collar and two of the German soldiers have beards, something British soldiers were not allowed to have, even during the winter. It certainly makes an interesting comparison to the sort of kit available to those on the other side of No Man’s Land. This entry was posted on 09/12/2012 by sommecourt. It was filed under Behind The Lines, France, German Army, Great War, Western Front, WW1 and was tagged with 1915, France, German Army, Winter, Winter War. Hello. Have you seen the image here ? This shows that the german army used this style of heavy duty winter wear on the Eastern Front as well.